A fundamental local law text for undergraduate paramedics in Australia and New Zealand. Applied Paramedic Law and Ethics Australia and New Zealand is the first of its kind to bring together legal and ethical concepts specifically for the Australian and New Zealand paramedic profession. 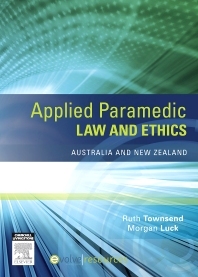 An indispensable guide for student paramedics, Applied Paramedic Law and Ethics Australia and New Zealand promotes the understanding of ethical principles and legal regulations through realistic scenarios and extensive case studies, which are available both in the book and on Elsevier’s Evolve platform. The book includes Australian state-specific legislation and local case law, and there is a chapter devoted specifically to the New Zealand paramedic service. This excellent law textbook focuses on the essential concepts and skills local paramedics need to respond to life-threatening emergencies in often-unfamiliar environments. For paramedics to determine the best course of action in any situation they need an intimate understanding of the profession’s code of conduct and current legal regulations. In its attention to key areas such as consent, negligence, child protection, mental health and record-keeping Applied Paramedic Law and Ethics Australia and New Zealand proves a fundamental resource for the undergraduate paramedic course in Australia and New Zealand. The textbook’s 13 comprehensive chapters are written in a clear, engaging style ideal for undergraduate paramedic students as well as ambulance service volunteers and practicing paramedics. 1 Why introduce paramedics to law, ethics and professionalism? Ruth Townsend is the Health Law and Ethics course convenor in the School of Medicine and College of Law at the Australian National University. Ruth is a qualified paramedic, nurse and lawyer.